Become the professional real estate agent/broker of Choice for 2.4 Million People! Wouldn't you like to be part of this growing niche market? Our Real Estate Divorce Specialist Training Course is your key to standing out from the crowd of other real estate professionals. Every year 1.2 million couples get divorced. Over 70% of these divorce cases involve either buying a home, selling a home or both. The market for real estate professionals is enormous. The current increase in divorces caused by the economic crisis is creating even higher demand for Real Estate Divorce Specialists. Our training program will make you the real estate professional of choice for divorcing clients. Divorcing couples are going through one of the most stressful times in their lives, and they need all the help they can get. Not just anyone's help, but knowledgeable help that only you will be able to provide for them. Wouldn't you like to be at the forefront of a market that includes 2.4 million people each year who need your help? Press the play button to watch. As a Certified Real Estate Divorce Specialist, you will be trained in the legal and tax aspects of divorce that most divorce lawyers don't even know. The spouse who moved out of the family home as long as 6 years ago can still take a $250,000 exclusion when the house is sold, even though the spouse who stayed in the house also took a $250,000 exclusion? Read how our students have benefited from this training. See how one Real Estate Divorce Specialist used the information in her Marketing Package to get an article printed in the Boston Globe and an interview with NBC! Increase referrals. The power of developing a niche is clear when you start to get referrals from attorneys, clients, friends, family and acquaintances. Everybody knows somebody who is going through a divorce, and once the word of your special expertise gets around, you will have all the new clients you need! Stand out from the crowd. In the ever-competitive market of real estate, it is often hard to distinguish yourself from other real estate professionals. As a Real Estate Divorce Specialist, your new designation will highlight your special skills and give people a reason to choose you over all the other professionals. Increase effectiveness. You will be better able to help your clients avoid common pitfalls of divorce in real estate and show them ways to save money on their taxes. Increase networking opportunities. All good entrepreneurs know that who you know is just as important as what you know. Your new designation will allow you to network with a whole new circle of contacts working with divorcing clients, including divorce attorneys, mental health professionals, financial planners and mediators. Gain publicity. Newspapers and other media are always looking for stories with a new angle. Your certification as a Real Estate Divorce Specialist is newsworthy and gives you the opportunity to work with the media to get publicity about your designation and get your name out in the public. The full marketing package that you receive after you complete the certification will show you how! Decrease marketing costs. Specialization allows you to focus on smaller market segments, so you can target your marketing efforts and make more money. Maximize your marketing dollar! Earn more money! Developing a real estate niche market is the simplest way for a small business or sole proprietor to make more money. The increased referrals, networking opportunities, and publicity and decreased marketing costs all result in more cash in your pocket! I. Anatomy of a Divorce by Gregg Greenstein, JD of Frascona, Joiner, Goodman and Greenstein, P.C. Gregg is a nationally-recognized divorce attorney who has been teaching about real estate and divorce for almost 30 years. His expertise and engaging presentation skills make the information easy to understand. Carol Ann is one of the nation's foremost experts on divorce and financial issues. She is a Certified Financial Divorce Practitioner and a Certified Financial Planner and has been working with divorcing clients for over 22 years. She is an expert in real estate niche marketing. You will receive a set of 4 DVD videos and a course workbook that you can follow along with as you watch the DVDs. Complete instructions are included. You will also receive the certification exam which you will complete and return to us. After passing the exam, you will receive our full Marketing Package so you can get started promoting your new designation immediately! 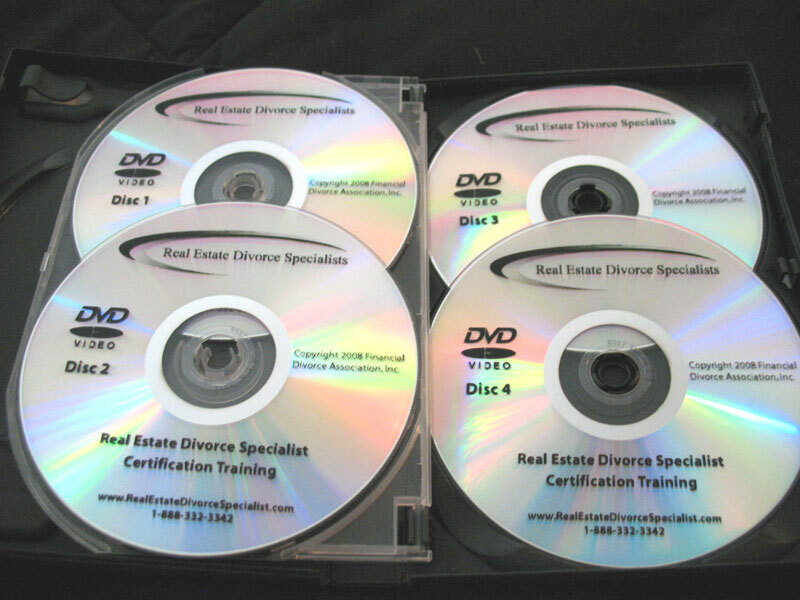 4 DVD Set with over 4 hours of training by the nation's leading experts in the fields of real estate, finances and divorce. An information-packed course workbook with examples and case studies. An open-book exam that you can complete at your own pace. Certification as a Real Estate Divorce Specialist! 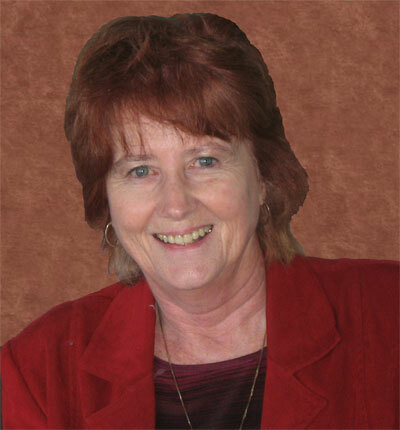 Carol Ann is one of the foremost authors in this field. You will receive her most popular book. Get client referrals directly from us! Listing in our Online Referral Directory is included FREE for one year. 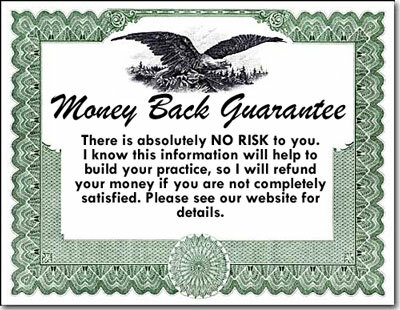 Click here for complete details on the money-back guarantee. This training and certification course is normally sold for $597.00. For a limited time, you may use the COUPON CODE REDS99 to receive a $99.00 DISCOUNT. 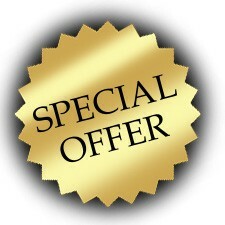 So you can get the complete training package for only $498.00. This is an amazing value! With the inside edge this training and certification will give you, you will make this cost back MANY TIMES in your first year. 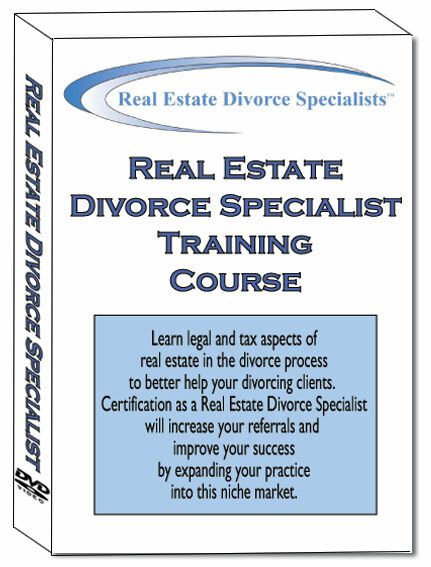 Are you ready to invest in your future as Certified Real Estate Divorce Specialist? Start advancing your career immediately in this growing real estate niche market. You have the option of paying part now and part later. Your credit card will be billed $270.00 now and $270.00 in 30 days. Carol Ann's New Book is Here!